Make more more more more furuba! especially yuki!! yuki!! yuki and tohru! You spelled dandelion wrong, but ah well...it's Furuba so I love it. Very nice pic. The scan of Tohru on the wall is weird, her head color is natural but her hand is totally white! the bg is very nice. but maybe you could put some birds in the sky? Tohru looks soo cute!! I never seen this picture of her ^^ it's really nice! I hope you make more!! she looks so cute almost cute enough to eat. 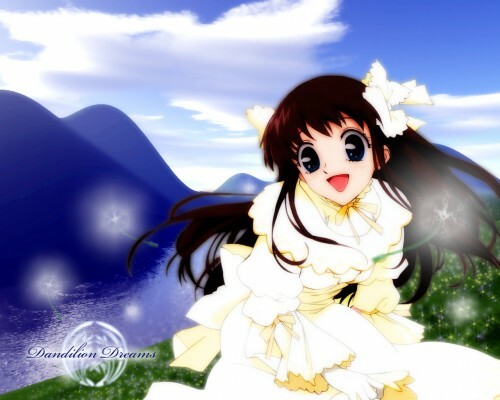 lovely~ the white clothes is suit tohru. Quote by KohakuXPThe scan of Tohru on the wall is weird, her head color is natural but her hand is totally white! OMG I've never seen Tohru so adorable! I love it ! the backround is absoutly stunning too.